your craftsmanship astounds me, I really hope one day I can come just a little close to you level of work, really stunning. Thank you Colin, my skills have definitely improved as I get further into the project. 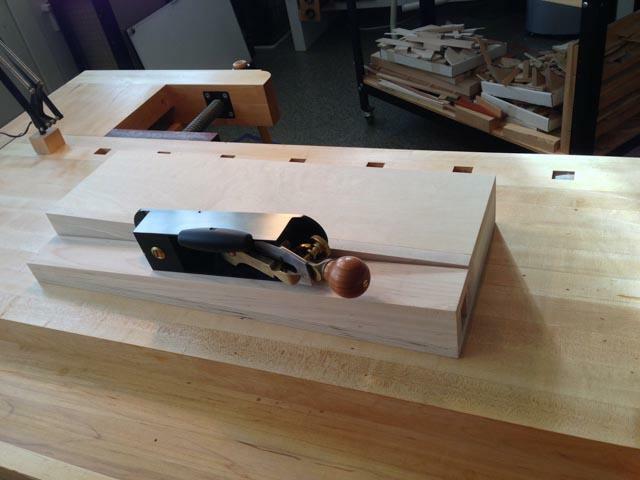 Gaetan gave me great advice, which is to think of potentially boring tasks like cutting hundreds of mortises for the deck carlings and ledges as a way of honing skills. It makes the time pass more tolerably, and skills definitely increase! 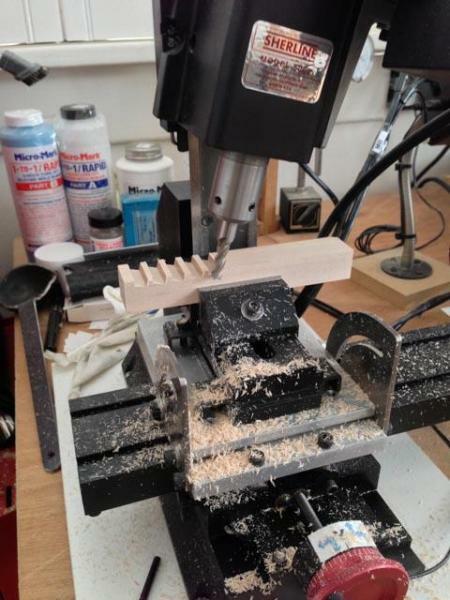 I still return to mechanical devices like mills and custom jigs to control cuts where precision is important and I don't trust my hand, but I am slowly learning more hand skills with chisels and planes. It is all part of the fun of the project. One of these days, I might try writing down what I have learned about craftsmanship so far through this project, from some great tutors on this site. 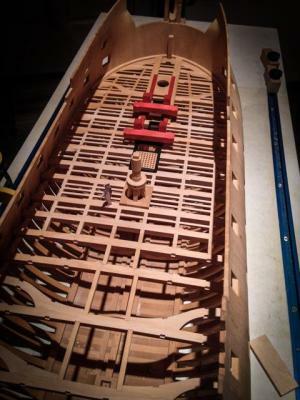 Here is an update with a few more carlings and ledges, plus the whelps loosely fitted on the capstan to see how it looks. I am looking forward to an entire weekend in the shop. I think that this would be a great contribution to the ship modelling community. Wonderful craftsmanship Mark. A museum quality piece. You should be extreemly proud. Thank you for sharing your craftsmanship with all of us. Thanks for taking the time to repost your exquisite build. There is always something else for me to learn when I review the reposted logs. Thank you Michael, Bob and Toni. Your comments help keep me going. I was feeling less skilled this weekend, still struggling with the whelps and chocks on the capstan. After trying several ways to cut the rabbets for the chocks, without success, I had another idea that I will try this afternoon. But while I was pondering this, I took some time to clear my head by moving from little to large. 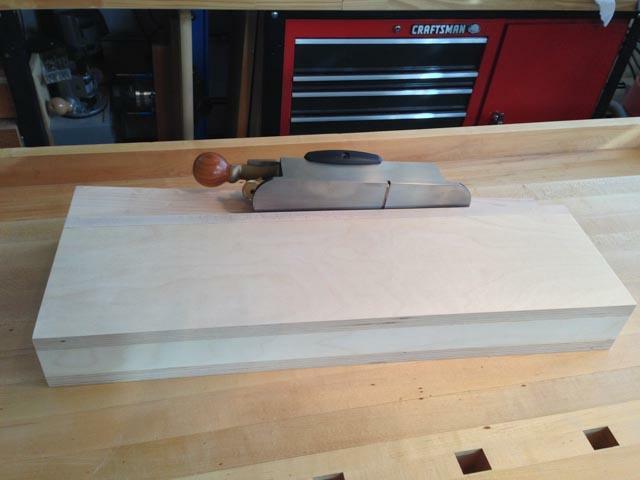 I re-leveled the top of my workbench (I haven't done that since I built it 20 years ago), using a hand plane. Very satisfying physical work after so much close precision. Lefties will note that I built this bench backwards, with the shoulder vise at the right end, since I am also left-handed. Welcome back Mark, good to see you are here again with this beautiful ship. 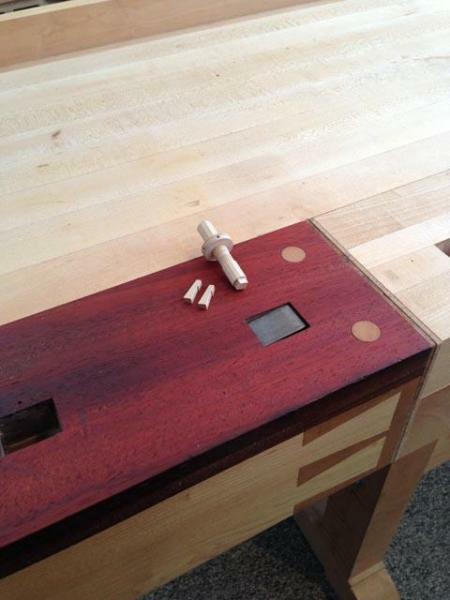 Well, that's a nice workbench that you built, Mark. Particularly those long dovetails - sweet detail! That's a workbench I can only dream of, it looks like it's from a Lie Nielsen catalog, really impressive. I have a small one on order but no where near as nice as yours (rather lightyears off.....). First I will dream about the big place, the workshop in general and then I will start to dream about the workbench with the two vise and all. I am showing a little template for marking the angled surfaces on the face of the whelps. The next challenge, which has really slowed me down, is cutting the bird mouth joints on the sides of the whelps for the chocks. 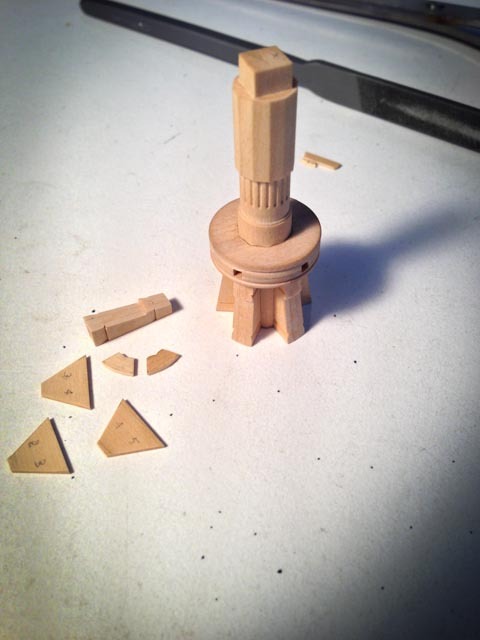 They are so small that I managed to cut my own finger with the marking gauge, and I cannot see or feel the score to register the chisel for the cut. And they are angled in two directions, which means that I cannot hold them down on the bench without them squirting out from under the clamp. So I built what my wife called a little "nest" for the whelps, with a two direction angled rabbet in a piece of maple for each one. It keeps them all level in both directions. When I get my energy back, I should be able to score them all at once with a straight edge across the group. And the last photo shows the latest carlings, and the two parts of the main hatch awaiting its coamings and round-up. Those are awkward customers to deal with, for sure. The jig holder is a great idea. 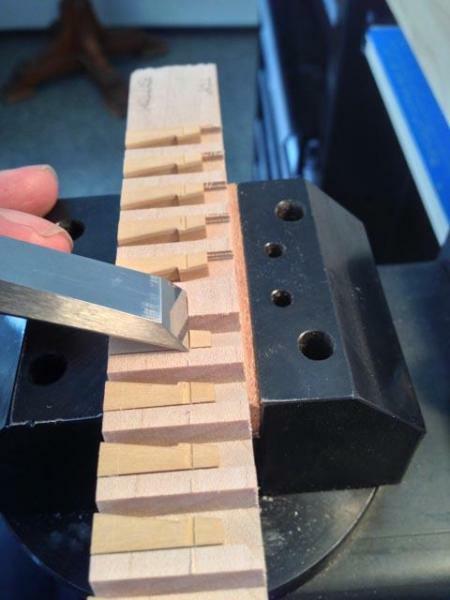 If you make register marks across the holder for the scores, that will align them all properly. I could really use that left-hand workbench (being a leftie myself) but I am soo used working right-handed so I dont mind anymore. I got a little further on cutting the birdsmouth rabbets on the whelps for the chocks. Using the little holding jig really helped. 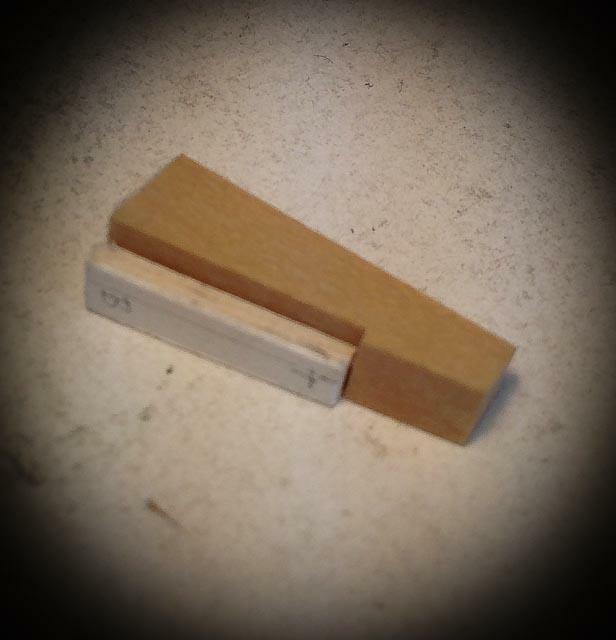 I was able to use the scoring marking gauge to keep the joints at the same height, and then a free-handed chisel cut for the birdmouth. By the way, I spot glued the whelps into the jig to hold them in place, then soaked them off with isopropyl alcohol 99%. The spots of glue were really tiny, but they held. Like Remco reported the other day, I temporarily ran out of energy for the ship. I moved to a larger scale project, and finally built a shooting board for planing exact right angled and straight cuts on the edges of small boards. This is a great design. It runs the plane along a sloping surface, so that the entire width of the plane is used to even out wear. It also provides a shearing cut, which helps with hard wood like boxwood. A shooting board works on the very clever idea that the plane blade in a normal plane does not go all the way to the side of the plane. So when it is run along the fence of the shooting board, the blade cuts into most of the fence, but not the little edge where the blades stops short of the side. This little edge provides a constant surface for guiding the plane. I still have to attach a fence, but that will have to wait for more time in the shop. With a good fence at exactly 90 degrees and a very sharp plane, I could trim the ends of slightly too long carlings, rather than using the disk sander. I'll see how it works. That is a Lie Nielsen plane designed to use with shooting boards. A gem to use. 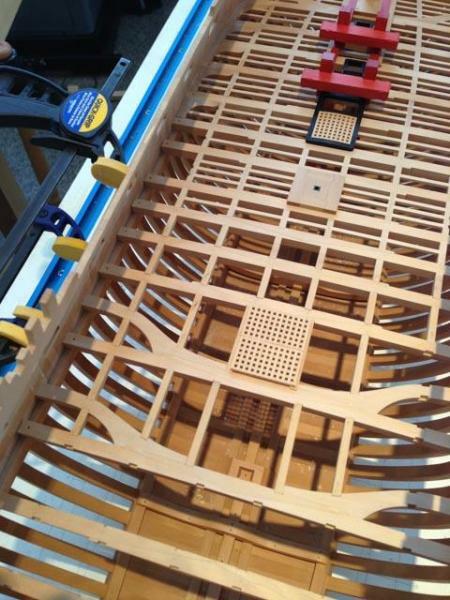 Now that inclined plane for planing is a neat idea! Thanks for sharing the idea. That Nielsen plane looks like a nice bit of kit, too. The scores on your whelps look great. Nice work - as usual, Mark. 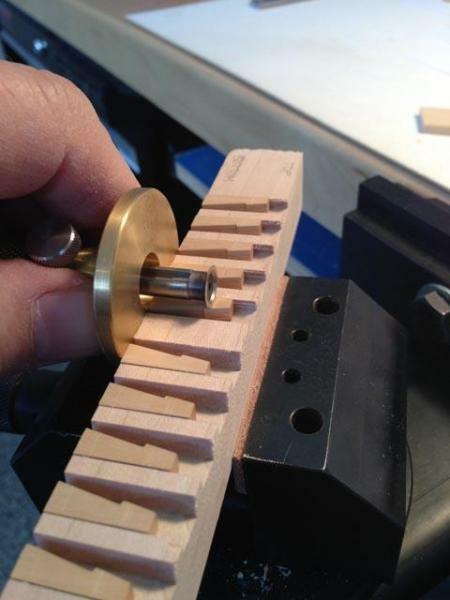 Terrific technique for getting all those mortises lined up, Mark. I like that scoring tool also! Ingenious Mark. Thanks for the link to the article too. And I'm still drooling over your big workbench! MArk, I don't know how you can bear to work on that bench. Its more like a piece of furniture. I'm sure you'll find new sources of energy to get back to Bellona. Thanks, druxey, Greg, Grant, Ed and Remco. 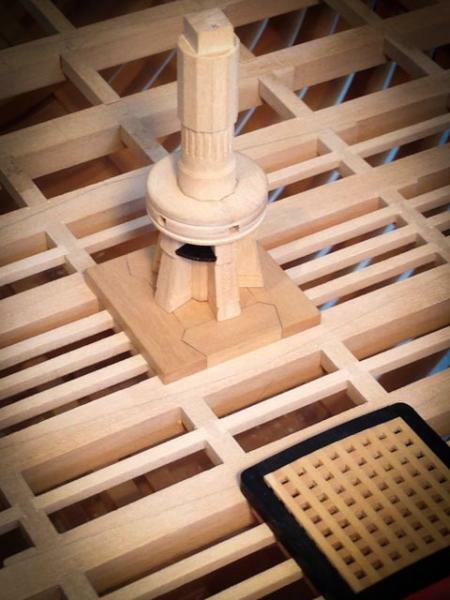 By the way, the workbench is based on an ancient European design, shown in the Workbench Book by Scott Landis. The noted woodworker Frank Klausz shows in great detail in this book (pp. 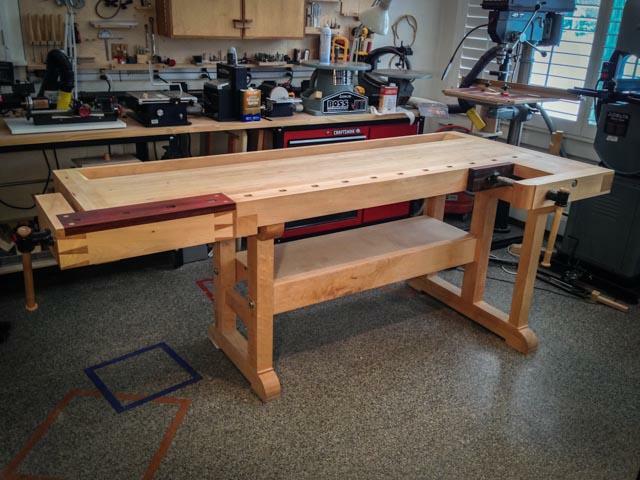 48-61) how he built his own example of a workbench his father and grandfather used. It so inspired me 20 years ago that I built one. Only mine was left-hand, and not as well crafted as Frank's. 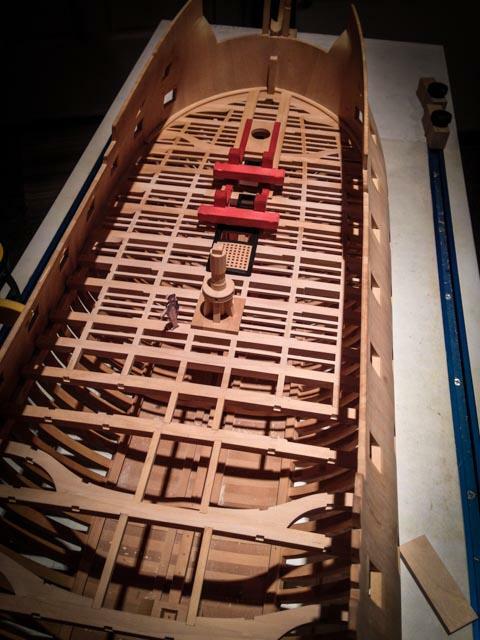 He says something about this that I think applies to ship models as well: "It's not my design--it's a thousand years old. 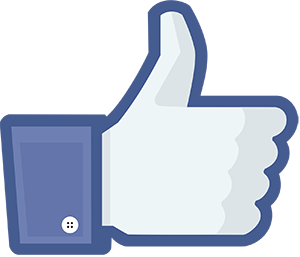 The only credit we can take for this is that we made it and it's nicely done." Ed, I just got the first scratches in my new finish on the bench, and initially thought, what a shame. But then I reminded myself, it is only a workbench! 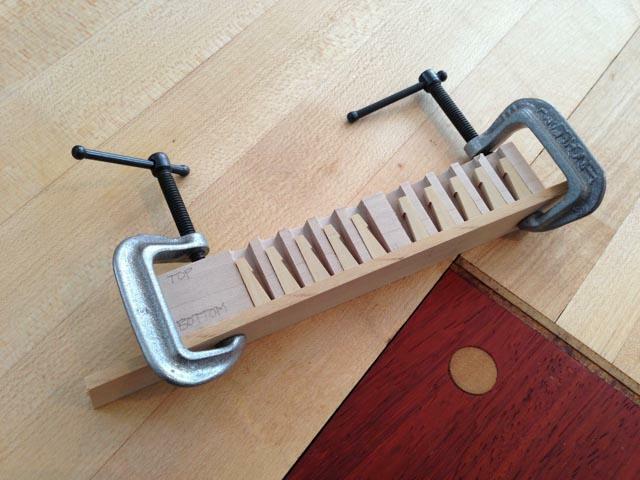 Remco, I haven't tried this yet, but I think a straight board used on this shooting board will not need clamping. Just pushing it against the fence, and holding it down firmly, should keep it in place. We'll see. I may have to put some lever clamps in if this doesn't work. I deliberately did not apply a finish on the jig, so that there would be friction between the board and the top of the jig. A piece of fine sandpaper attached to the top may help if it needs more friction. Mark, Shooting boards are great I have been using them for years, but the one you have just made is a beauty. The plane looks nice too.Up here in the remote boonies of Canada we have a Lee Valley Shop and I am rather partial to the Veritas brand of planes. I will be waiting to hear what you think of the sliding nature of the cut on the ends. A well though out design for sure. Scott's workbench book is a gem. When you get a chance check out page 13 in Fine Woodworking's Design Book Two. I might have missed it, and since I am too new to remember the old log, may I ask what kind of wood do I see in the pictures? Mine is not as yellow as European Box; but it is a delight to work with. Fine, even grain, holds detail, cuts precisely. Thanks, Mark. What I like about your boxwood from a visual is how even the color. I have a couple logs of boxwood from Turkey that I am now sawing to small lumber and it seems real nice, but the visual shows the various grain patterns. I don't think it affects the workability but I'll have to see how it looks when making small pieces. It might not be a factor, but others might already know better than I.
I made a workbench almost exactly like yours except I have a different shoulder vise and it is 'right handed'. It was made years ago and I have never done a refurbishing. Reading that you refinished yours has gotten me thinking it's past time for me to do the same. I don't know if you are interested but IPMS will be in Loveland this summer which just might be in your neck of the woods. It's always nice to see what others can do with other forms of model work. Some are real artist, though I've never seen anyone who can beat your skills. Thanks again for the info on the wood. I finally got to grips with the chocks for the capstan, which I now realize had been running me into the ground. I tried a half dozen different ways to machine them since they were so small and hard to hold. 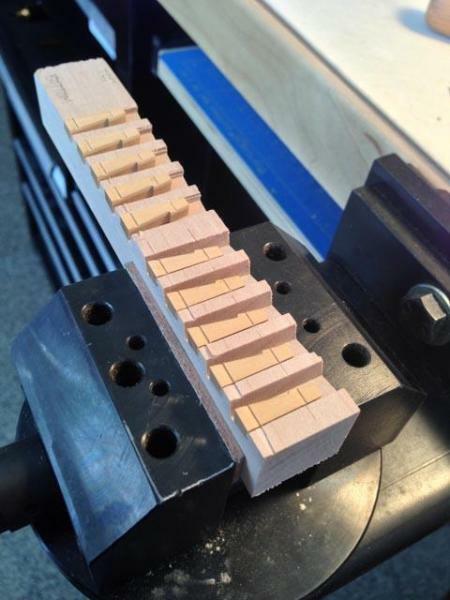 But in the end, I used a table saw to cut the angles, and then chisels and files to hand fit them into their slots. Smallest pieces I have ever fabricated. I am thinking about color. 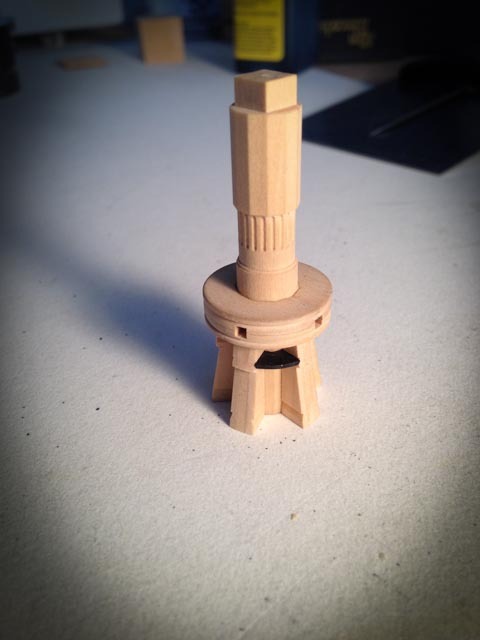 I had long planned to do a red or black capstan, since so many 18th century models have one or the other. But the other day I saw the color photo of HMS Yarmouth, 1748, in Franklin's Navy Board Ship Models. It has the chocks in black, and the rest of the capstan natural. I tried one in the photo I am showing (the chock is still loose, and not yet tight up against the rabbet on top). I will sleep on it, and then decide once and for all. I have the dilemma Remco was facing about blackening his mast tops, which would hide all of his great detail. I am feeling the same about the capstan. Impressive as always, Mark. I'm sure whatever you decide on color will be just right. Very nice Mark, those certainly look small, Just how big are they? Your work is beautiful! I'd say, use a colour combination that best allows that beauty to show through.